Oh my goodness! What a mad month it's been. I've not baked or blogged, entered anyones blogging challenges, nearly as much as I'd like to have done, but life gets in the way sometimes. You may remember I said a while back that Disneyboi and I were at long last selling our individual properties and buying somewhere together. Well, we are half-way there! He has sold his flat and for the first part of the month we were packing up all of his belongings and putting them in storage. We did that, he has moved into mine until we get that sold and get a new place together. This was stressful enough, but add on top of the fact we had a pre-planned trip to London two days before contracts were signed on Disneyboi’s place. We did all our moves and the following day made our way to London. And we never do London at a relaxed pace – we walk for miles, in very hot temperatures! We are back now and going back to 'everyday' work seems like a break! Back to the baking and I made these in a spare mad moment a couple of weeks back. The photos are pretty bad, some of the cookies were over baked, but having read all of the above I'm sure you will forgive me!! My idea was to tie in with this month’s Treat Petite, the theme of which is ‘Summertime Special’. 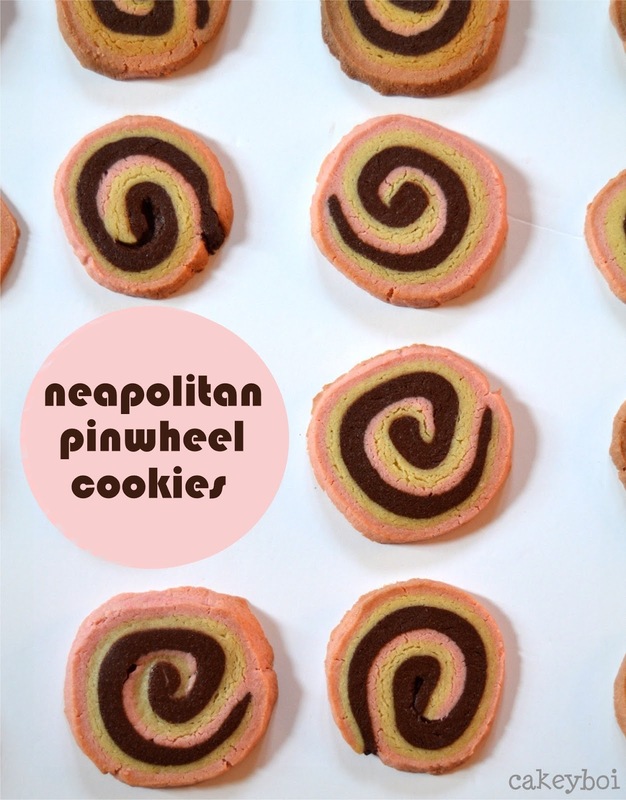 My concept was to take the flavours of traditional Neapolitan ice-cream – chocolate, strawberry and vanilla and turn that combination into a pinwheel cookie. Sounds pretty summery, right? It was pretty straightforward – knock-up some cookie dough, divide into three, flavour one with cocoa powder, one with strawberry flavouring and pink colouring, and the third a hit of vanilla extract. Roll each slab of cookie dough into a rectangle, place on top of one another then tightly roll them up. I chilled the rolled log in the fridge for a while then sliced it into rounds, baking each one (or in my case, over baking!). The second batch was less crispy and kept their colour better. The flavours worked together very well and tasted like neapolitan ice cream in cookie form – so my plan did work after all. Beat together the softened butter and sugar until light and fluffy. Add the egg yolks and stir through. Carefully divide this mix into three separate lots, all weighing the same. Take one batch, add the vanilla extract and beat in, before folding in 200 grams of the flour. Take this cookie dough, wrap in cling film and pop into the fridge. Take another third and add 150 grams flour and 50 grams of cocoa powder. Stir this through until a dough forms, wrap in cling film and chill in the fridge again. Take the last third, add the strawberry flavouring and pink colouring (amount depends on type you use). Add the flour and fold until a dough forms. Transfer to cling film and chill in the fridge. Once all portions of dough have chilled for a couple of hours, roll each one out to a rectangle shape about 9”x13”. Place each rectangle on top of each other, preferably with the vanilla portion in the middle, but that's up to you. Roll the combined rectangle from the longest side and roll tightly all the way until a log is formed. Wrap it tightly and chill again for at least two hours, preferably overnight. Once chilled, with a sharp knife cut discs from the log, of the same thickness and place these onto cookie sheets lined with greaseproof paper. Transfer to the fridge. Whilst the cookies are chilling, preheat the oven to 180C. Bake the cookies in the oven for approximately 10 minutes or until they just turn very slightly golden on the edges. Remove from the oven and transfer to a cooling rack immediately, to avoid further contact from the heat of the cookie sheet. Allow to cool fully. I am entering these into Treat Petite hosted by Kat, The Baking Explorer and this month me, for the theme Summertime Special as Neapolitan ice-cream reminds me of summer. You are harsh on yourself, I think they look great! They make me think of childhood cartoons... Hope all the flat stuff works out soon for you both! We went through the same, but all my partners stuff was checked out, not in storage, ooops! These are the prettiest biscuits I've seen in a long time! What a brilliant idea! I love these!